Non solo in Italia i (numerosi) componenti la famiglia Bearzi sono presenti nel mondo della cultura e della scienza. Who hasn’t fantasized about the unique thrill of working among charismatic and clever dolphins in the wild? We need not live this solely in our imaginations anymore. With Dolphin Confidential Maddalena Bearzi invites all of us shore-bound dreamers to join her and travel alongside the dolphins. In this fascinating account, she takes us inside the world of a marine scientist and offers a firsthand understanding of marine mammal behavior, as well as the frustrations, delights, and creativity that make up dolphin research. In this intimate narrative, Bearzi recounts her experiences at sea, tracing her own evolution as a woman and a scientist from her earliest travails to her transformation into an advocate for conservation and dolphin protection. These compelling, in-depth descriptions of her fieldwork also present a captivating look into dolphin social behavior and intelligence. The central part of the book is devoted to the metropolitan bottlenose dolphins of California, as Bearzi draws on her extensive experience to offer insights into the daily lives of these creatures—as well as the difficulties involved in collecting the data that transforms hunches into hypotheses and eventually scientific facts. The book closes by addressing the critical environmental and conservation problems facing these magnificent, socially complex, highly intelligent, and emotional beings. 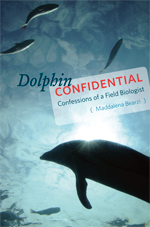 An honest, down-to-earth analysis of what it means to be a marine biologist in the field today, Dolphin Confidential offers an entertaining, never less than candid, and always informative description of life among the dolphins.